You could make the argument that there is nothing else quite like Sofra in the Boston area. With its Lebanese, Israeli, and Moroccan influences, Sofra is a true Middle Eastern bakery and restaurant. It simply cannot be compared with any other restaurant in the city. This relatively new hot spot even boasts dishes typical to Turkey and Greece. Maura Kilpatrick, the genius pastry chef behind Oleana (one of the top Mediterranean restaurants in the area, in conjunction with award-winning chef Ana Sortun), opened this quaint little place on the border between Watertown and Cambridge. If you are a BU student, do not hesitate to go. It is very much worth the $20 cab ride. The first thing you will notice when you walk in is the Middle Eastern themed décor. Sofra is adorned with gorgeous Persian rugs, plush sofas, and hand-sewn pillows of every color, and you will feel like you stepped into a Persian grandmother's living room. For sale are all of their signature homemade items, different types of exotic and traditional spices, and other goods for your kitchen. What will tempt you are the delectable looking sweets, pastries and mezze salads behind the glass case. The hardest part is deciding what you want. With options such as shakshuka (a typical Israeli dish with eggs poached in a spicy tomato sauce), haloumi sandwich with feta butter, or the Persian spiced donut, it is nearly impossible to make a choice. I had to try one of the mezzes and being as feta-obsessed as I am, I chose the whipped red pepper feta dip. 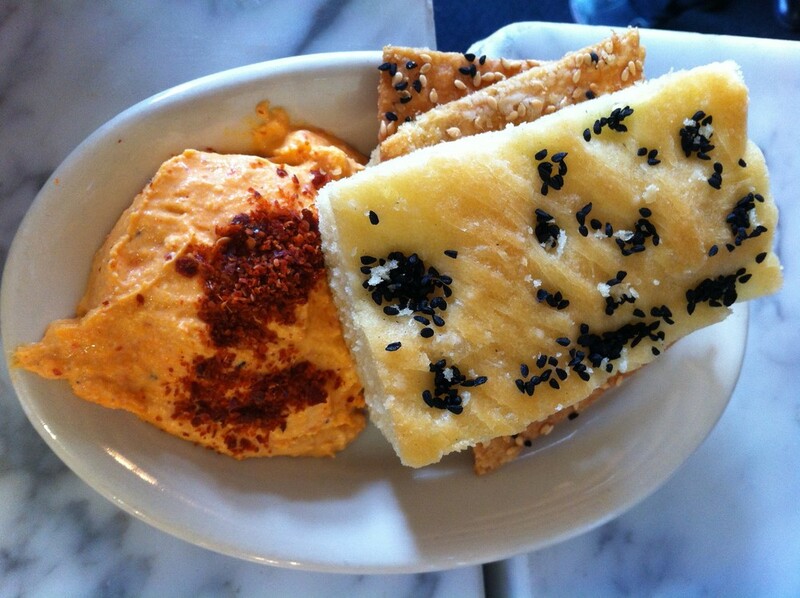 Sofra served it with fresh-baked crackers and focaccia. For the main course I went for the Israeli Madame, which is made with their homemade challah, beet-cured salmon, manouri cheese, and topped with a fried egg. Although a little too salty for my taste, the whipped feta dip was still perfectly creamy and contrasted nicely with the crispy crackers. The warm homemade challah was the best part of the sandwich. The beet added a beautiful magenta color to the salmon without lending it an overpowering flavor. The soft manouri cheese spread on the challah added just the right touch. I also got to try my friend’s shawarma, which was very unique. Sofra had cooked the chicken in a savory sauce with a hint of cinnamon, and the dish was surprisingly delicious. After everything I ate, I still wasn’t going to leave without trying one of the desserts. The first thing that caught my attention was the chocolate cookie. It was two chocolate cookies filled with a sweet “milk jam”. The filling is basically the Middle Eastern equivalent of South America’s Dulce de Leche. They call it the Maureo cookie. I was in cookie heaven. Once again, if you have an adventurous taste or if you simply like delicious food, I highly recommend Sofra Bakery.